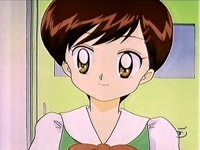 Nanami is Miyu and Kanata's classmate. She has short brunet hair and is a very good friend of Miyu and often goes shopping with her and Aya. Nanami is usually very playful and energetic but can sometimes be easily tired after a hard task. She also has a huge appetite. She likes old school style of clothes.